Rajesh Prasanna & Rishab Prasanna are among the top flute players of the young generation of the country. Born and trained in a renowned family of musicians from Varanasi, they’re dipped into music since they were born, surrounded by musicians who have traditionally played and nurtured the shehnai for over two and half centuries, now recognized as maestros of bansuri in India and in the World. 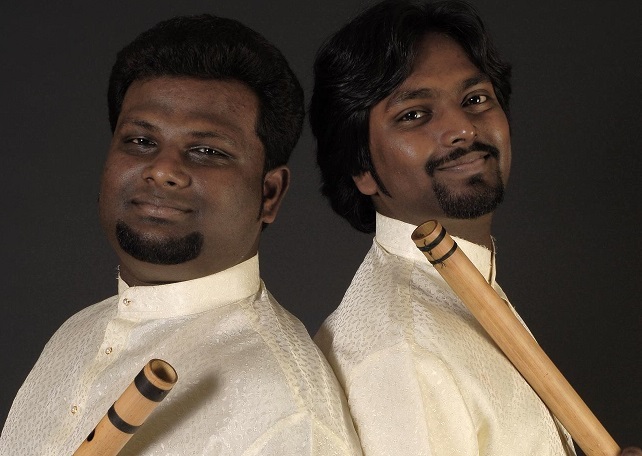 They are the sons of Pandit Rajendra Prasanna who is one of the great flute and shehnai player in India. They received their training from their grandfather Pt. Raghunath Prasanna, who is the first in the Prasanna family to introduce flute playing otherwise known for the shahnai playing. They were also trained and guided by their Tauji Pt. Ravi Shankar Prasanna, and Uncle Sh. Rakesh Prasanna. It was however under the tutelage of their father Pt. Rajendra Prasanna that they learnt the finer skills and artistic intricacies of raga and the advanced techniques that helped them to blossom as solo players in the filed of classical music. Their technique seems limitless and let their music flow through their creativity and melodic sense, influenced by with Gayaki Ang. These talented young boys have imbibed the subtle nuances of Banaras Gharana and are equally at ease with the light classical genres like thumri, chaiti, kajri and dhun.